What is Non-muscle Invasive Bladder Cancer? Non-muscle invasive bladder cancer (NMIBC) is cancer found in the tissue that lines the inner surface of the bladder. The bladder muscle is not involved. Bladder cancer is the 5th most common cancer in the United States. Over 79,000 people will be diagnosed in the United States with bladder cancer in 2016. Bladder cancer is more common in males than females. Three times more men than women tend to get this disease. Bladder cancer is more common as a person grows older. It is found most often in the age group of 75-84. More Caucasians than any other ethnicities seem to develop bladder cancer. However, there are more African-Americans who do not survive the disease. Cancer is when your body cells grow out of control. When this happens the body cannot work the way it should. Most cancers form a lump called a tumor or a growth. Some cancers grow and spread fast. Others grow more slowly. Not all lumps are cancers. Cancerous lumps are sometimes called malignant tumors. 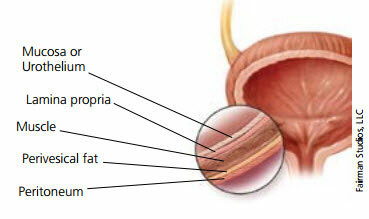 The bladder is where the body stores urine before it leaves the body. Urine is what we call the liquid waste made by the kidneys. The bladder is a hollow organ in the pelvis with flexible, muscular walls. The bladder can get bigger or smaller as it fills with urine. Urine is carried to the bladder through tubes called ureters. When you go to the bathroom, the muscles in your bladder will contract. They then push urine out through a tube called the urethra. When cells of the bladder grow abnormally, they can become bladder cancer. 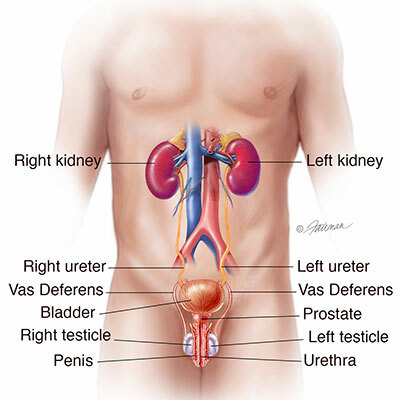 A person with bladder cancer will have one or more tumors in his/her bladder. How Does Bladder Cancer Develop and Spread? The bladder wall has many layers, made up of different types of cells. 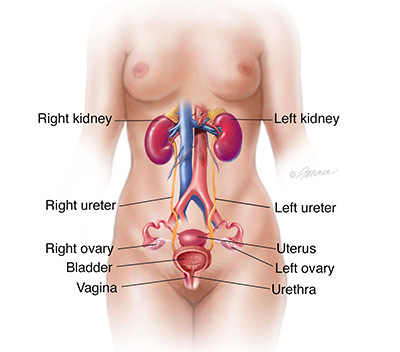 Most bladder cancers start in the urothelium or transitional epithelium. This is the inside lining of the bladder. Transitional cell carcinoma is cancer that forms in the cells of the urothelium. Bladder cancer gets worse when it grows into or through other layers of the bladder wall. Over time, the cancer may grow outside the bladder into tissues close by. Bladder cancer may spread to lymph nodes nearby and others farther away. The cancer may reach the bones, the lungs, or the liver and other parts of the body. With NMIBC, the tumor will not have spread outside the bladder.